Carbonfund.org celebrates our 9 years of partnership with JetBlue Airways. Since 2008, JetBlue and their dedicated crew and customers have reduced over 1.7 billion pounds of carbon dioxide emissions. This is a huge accomplishment for any company. JetBlue is helping to preserve nearly 500,000 acres of Brazilian Rainforest. Often called the Lungs of the Planet, the project is preserving land that is host to rare and highly endangered eco systems, which support over 30,000 types of plants, and wildlife, including howler monkeys, fresh water dolphins and scarlet macaws. The projects help local communities too, making forest preservation economically viable. 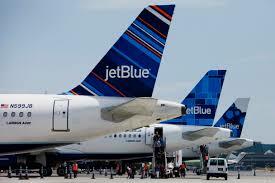 JetBlue has also participated in tree planting with Carbonfund.org. In 2013, a tragic fire burned through Angeles National Forest located in Arcadia, CA. To restore the area and mitigate emissions from flights, JetBlue sponsored the planting of 25,000 trees by the U.S. Forest Service. The planting was completed in August 2015. The total planting area encompasses 160 acres and will be rejuvenated with big cone Douglas fir and gray pine. The replanting restores a vital watershed area in danger from erosion after the fire, and helps maintain pre-fire levels of native biodiversity. Signing one of the biggest renewable jet fuel agreements in aviation history: committing to purchase 330 million gallons of renewable fuel over ten years. Creating a partnership with U.S. Fish & Wildlife Service to tackle the issue of illegal wildlife trade. Implementing extensive inflight recycling programs in all domestic cities; recycling an estimated 30 million bottles and cans annually. Implementing a composting program at several airports. Creating an innovative airport farm at JFK Terminal 5, engaging crewmember volunteers for plant cultivation and donating produce to City Harvest. Committing to transition wholly-owned ground services equipment to electric where it is safe for airport operations. Starting a research initiative in partnership with The Ocean Foundation to determine the connection between ecosystem health in the Caribbean and JetBlue revenue to those destinations. One Thing That’s Green: a campaign to serve neighborhoods throughout the country from Seattle to Boston, New York to Long Beach. With the help of their customers, crewmembers plant trees, cleanup beaches, beautify parks and plant flowers. These events continue to help JetBlue inspire humanity in the cities they serve. Carbonfund.org congratulates JetBlue for reaching the major milestone of exceeding 1.7 billion pounds of CO2 emission reductions and we are proud to partner with them in these efforts.